The quality of food served by school lunchrooms across the country is appalling. Although my little one isn't in school (yet), I am saddened that many school districts feed children hot dogs, greasy pizza, and nachos for lunch. How this has even become acceptable is the subject of a future investigation… but in the meantime, do whatever you can to take control of the situation by packing your own lunches. Don't go down the path of buying conveniently packaged "Back To School" snacks that line the shelves like.... Mott's Strawberry Applesauce, Little Debbie Oatmeal Pies and Fruit By The Foot. Not only do these get expensive, but they're just as unhealthy (maybe worse) than what they serve in school lunchrooms filled with additives to avoid and tons of added sugar. Even organic packaged foods can be extremely processed and unhealthy without any real nutrition. Take the new Organic Lunchables for example. These might be certified organic, but I'd NEVER buy them (see the ingredients here). Get the new kid's lunchbox recipe here. When packing lunches (for myself or anyone), I love the containers by my partner Ukonserve… they're non-toxic and leak-proof. I've personally used their containers when traveling, and their divided containers are PERFECT for packing lunches. You can put sandwiches, sliced fruit and veggies in their own little leak-proof compartments, and then tuck it into one of these lunch totes made from recycled plastic bottles! Ukonserve will give you 20% off their entire store when you use the code FOODBABE at checkout (ends next Monday 8/21). Food Kozy Wraps – Get rid of plastic baggies for good! These wraps are reusable and great for wrapping sandwiches. Glass & Silicone Water Bottles – Instead of buying packaged juice drinks full of sugar and fake flavors, fill these up with filtered water instead. If you have kids in sports – these are a must-have! Ice-Packs – These non-toxic gel packs keep lunches cool. Eco-Friendly Lunch Totes made from recycled plastic bottles! Divided Containers – These leak-proof containers make packing sandwiches and sides easy. 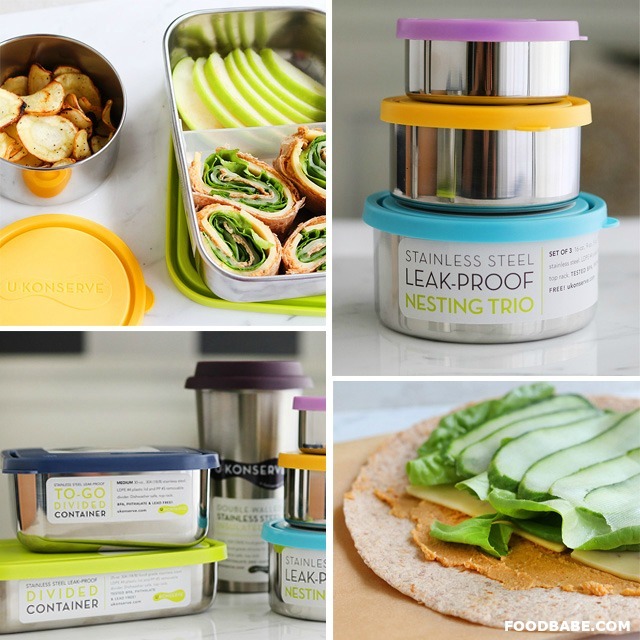 Pick up your lunchbox essentials here – and don't forget to enter the code "FOODBABE" at checkout to get 20% off by Monday. If you know anyone who would love some back-to-school lunch tips like this, please forward this email to them!